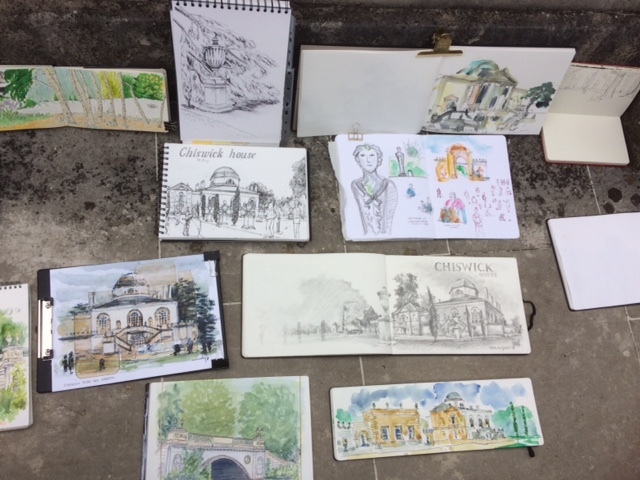 (Nicky Browne writes) Lord Burlington's elegant eighteenth century Chiswick House and Gardens hosted a dry and pleasant August sketchcrawl. The gardens are famous for their cedars and their serpentine paths through the woods. 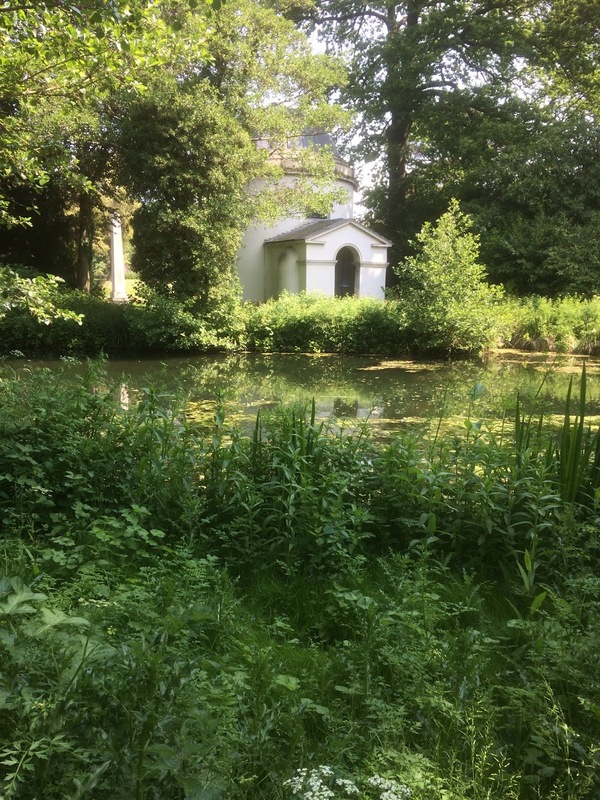 There are sculptures, a waterfall and a temple beside a small lake with an obelisk. Most people challenged themselves by drawing the Palladian house with its six columns and dome, and did so impressively and magnificently! 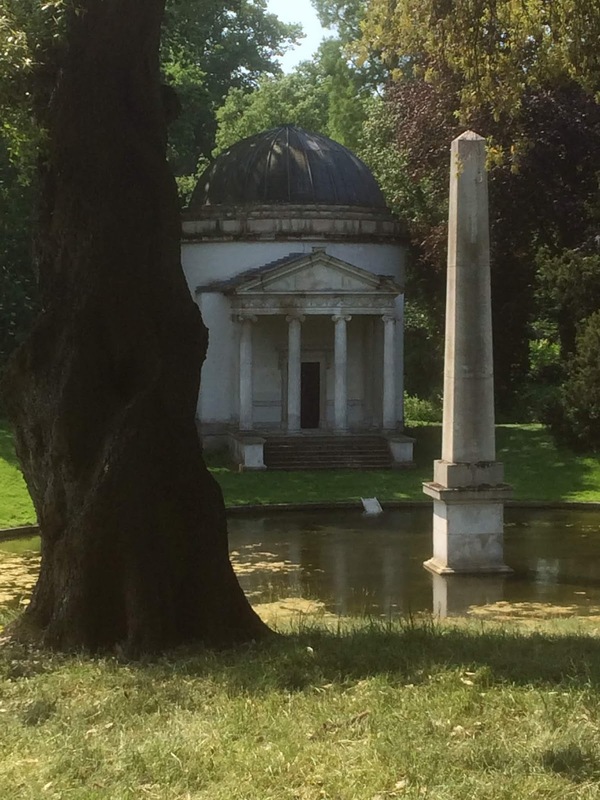 Lord Burlington's design was influenced principally by the architecture of classical Rome, and also by its re-interpreter, Andrea Palladio. It is said to be based on Palladio's last masterpiece, Villa Capra, known as La Rotunda, near Vicenza in Italy and there is a statue to him at the front of the building. Certainly Burlington followed Palladio's thesis: “form formed by the landscape and forming the landscape”. William Kent the architect and garden designer developed the surrounding park in keeping with this concept. Making the most of the light summer evenings, we ran evening sketching sessions in June, July and August. 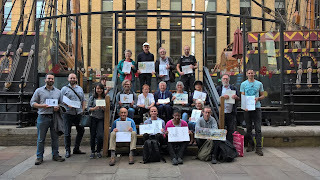 We explored south of the river around Borough and Bankside, finishing with river views of the ever-changing City of London. 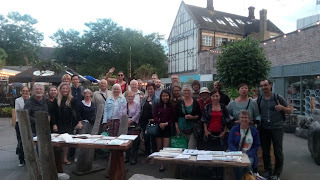 In June we met near the Golden Hinde, a replica of Sir Francis Drake’s ship near London Bridge. 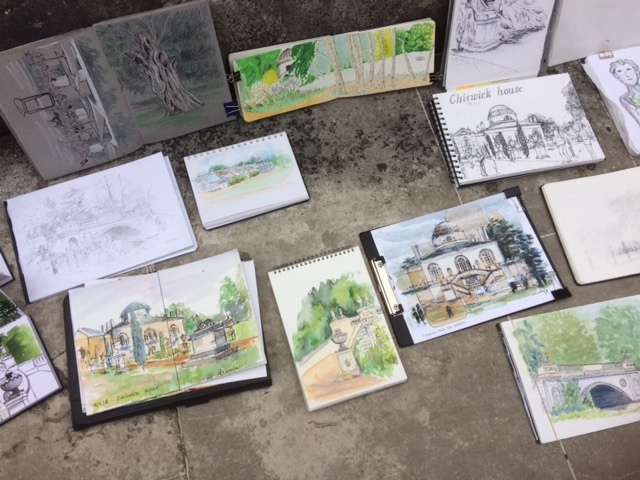 We sketched the ship, the area round Southwark Cathedral, and the remains of Winchester Palace, with its fourteenth century rose window, contrasted with modern developments in the area. 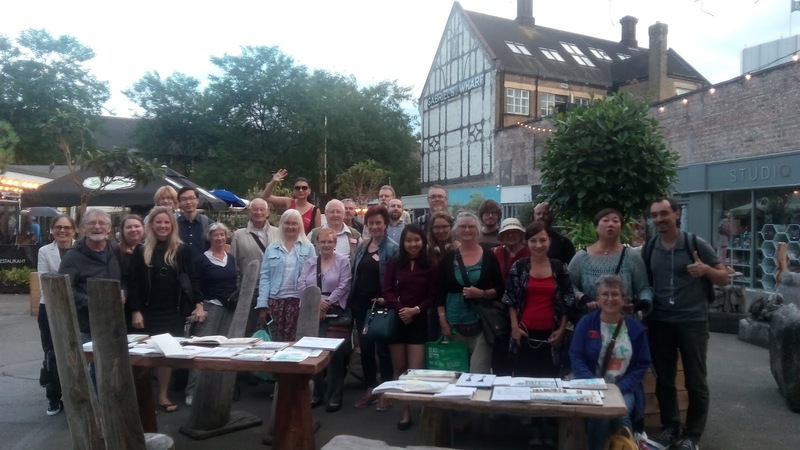 The new ‘foodie hub’ of Flat Iron Square was our meeting point in July. We drew here, and in the surrounding streets, with small shops, the railway bridge and arches, and views of the Shard. August found us by further west on the South Bank, meeting at Gabriel’s Wharf. 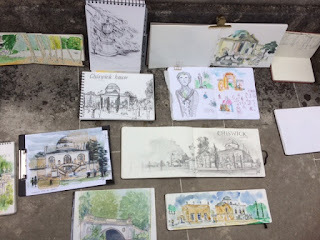 Some people drew the shops and cafes of Gabriel’s Wharf, others river views towards the Oxo Tower and the City. 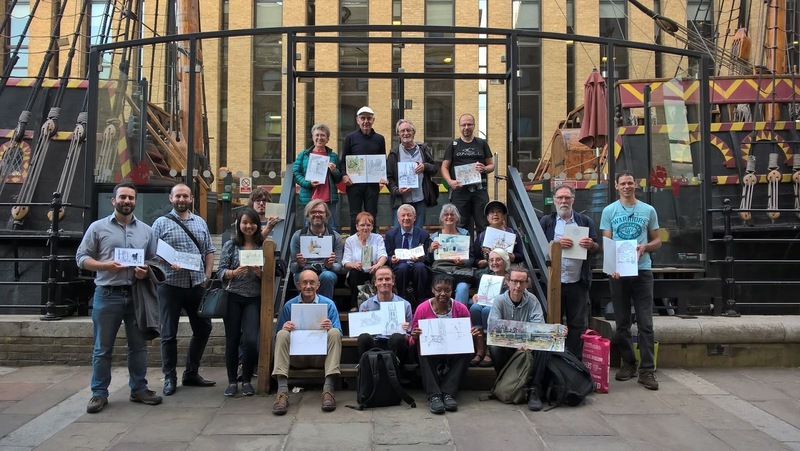 All of these areas show the complex layers of London’s history, underpinning the arts and leisure activities now prominent on the South Bank. 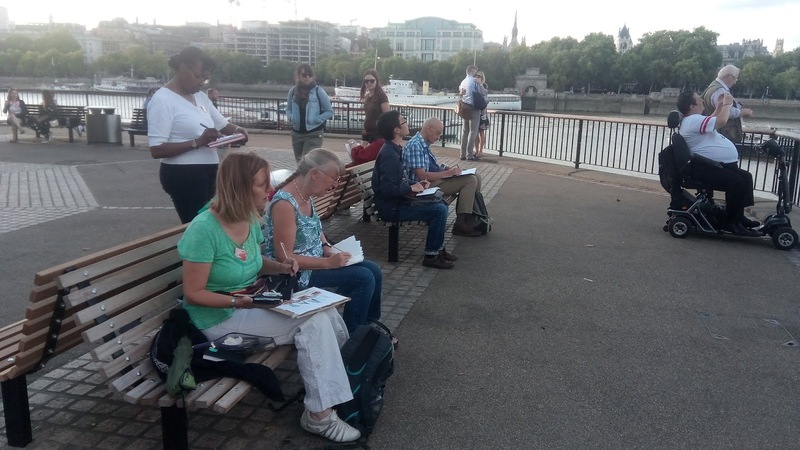 We were pleased to welcome many new sketchers to our summer evening sessions, as well as familiar faces. 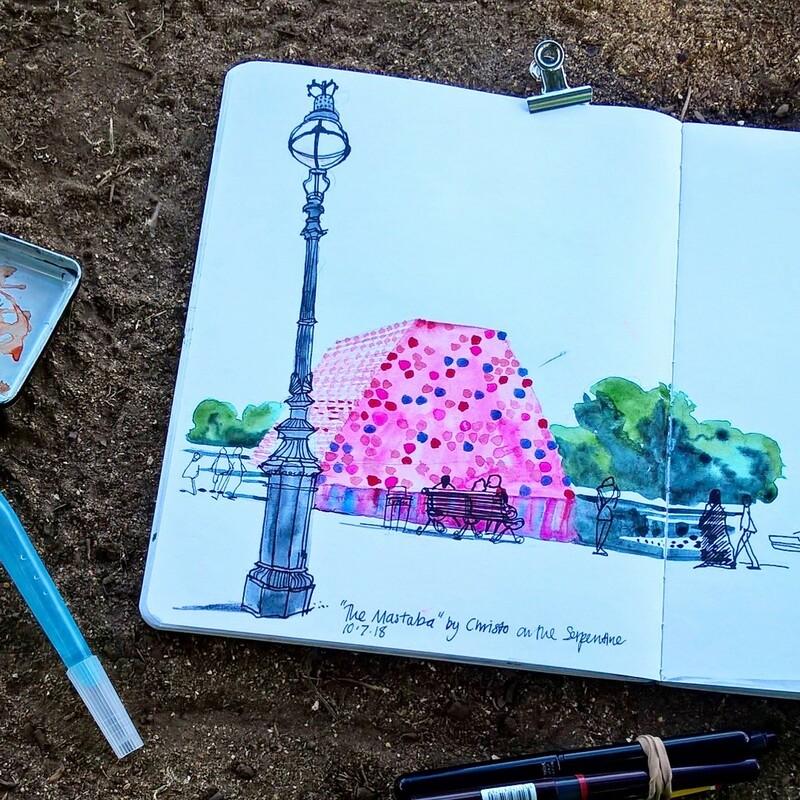 We hope you will all want to return to sketch and explore London with us. Photographs by John Webb and Jo Dungey. 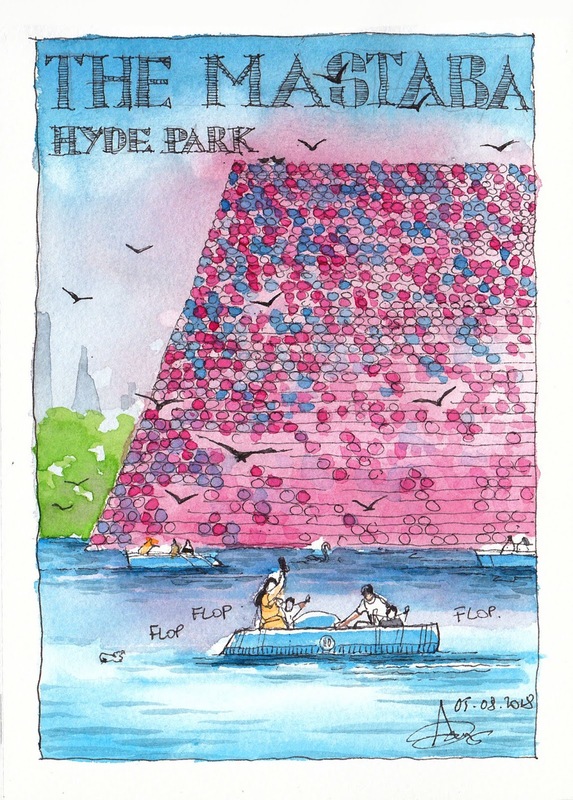 (Jo Dungey writes) In June this year, London’s Hyde Park acquired a dramatic new feature. 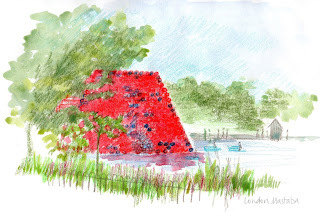 The London Mastaba is a huge sculpture, temporarily installed to float on The Serpentine lake. Several members of Urban Sketchers London have worked on location in Hyde Park to create works portraying the London Mastaba, which we show here. The sculpture is the work of Christo and Jeanne Claude, artists known for the creation of huge environmental installations. These have involved wrapping famous buildings such as the Reichstag in Berlin, and the Pont Neuf in Paris. They have also created huge interventions in landscape, including Running Fence in California, and Valley Curtain in the Rocky Mountains, Colorado, USA. 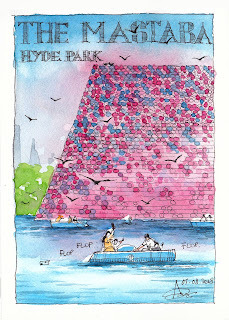 The London Mastaba is made from 7,506 horizontally stacked barrels painted in red, white, blue and mauve. Historically, a mastaba was a type of flat-topped tomb built in ancient Egypt. 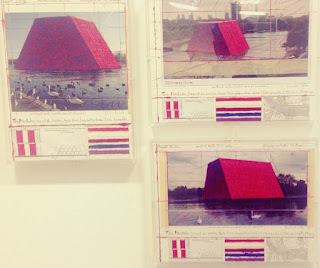 This form was used to create a huge installation which floats on The Serpentine lake. The nearby Serpentine Gallery is presenting an exhibition: Christo and Jeanne Claude: Barrels and The Mastaba 1958-2018. 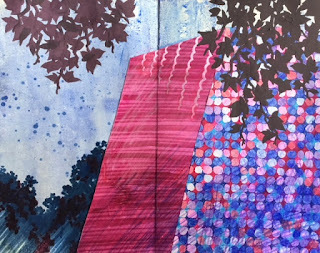 The exhibition includes sculptures, drawings, collages, scale models and photographs from the last sixty years of the two artists’ work. The exhibition runs until 9 September 2018 and the London Mastaba is installed until 23 September 2018. Reflections glittering in the Serpentine waters, the London Mastaba is a symbol of London's long, hot summer. See it if you can.